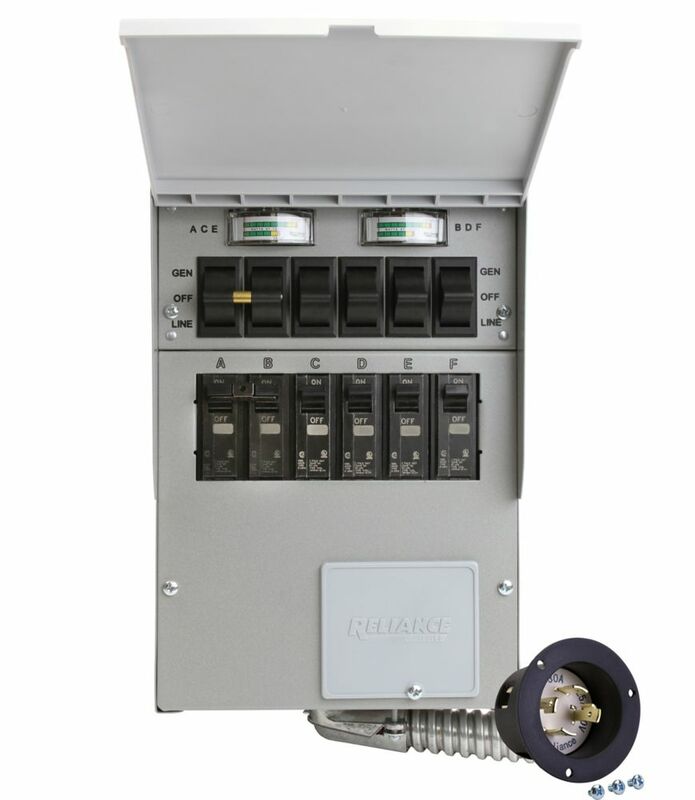 The Reliance Controls 30 Amp 125/250-Volt 7,500-Watt 6-Circuit Transfer Switch Kit includes the necessities to make a professional transfer switch installation in a home, office or small business. The transfer switch enables the electrical system of the building to accept the power of a portable generator to run up to 6 single-pole circuits or 4 single-pole circuits and one 20 Amp 2-pole circuit. It allows you to power electrical appliances, devices and lighting during a power outage. Pre-wired design to install quickly. 30 Amp 7500-Watt 6-Circuit indoor Transfer Switch Kit The Reliance Controls 30 Amp 125/250-Volt 7,500-Watt 6-Circuit Transfer Switch Kit includes the necessities to make a professional transfer switch installation in a home, office or small business. The transfer switch enables the electrical system of the building to accept the power of a portable generator to run up to 6 single-pole circuits or 4 single-pole circuits and one 20 Amp 2-pole circuit. It allows you to power electrical appliances, devices and lighting during a power outage. Pre-wired design to install quickly. 30 Amp 7500-Watt 6-Circuit indoor Transfer Switch Kit is rated 4.7 out of 5 by 203. Rated 5 out of 5 by Notanelectrician from The switch is well made and the instructional videos from... The switch is well made and the instructional videos from Reliance made the installation a relatively easy step-by-step process. Wiring the switch to the panel went quickly. Total install took parts of three consecutive days to run thru cellar and garage, mount boxes, etc. Works very well. Rated 5 out of 5 by Eric from Definitely a must have. ... Definitely a must have. Rated 4 out of 5 by CH from Easy for DIYer to install. looks and works good. Easy for DIYer to install. looks and works good. Rated 5 out of 5 by HomeDepotCustomer from Excellent product and price !... Excellent product and price ! Rated 5 out of 5 by James from Easy Install, Works Good I bought this product because we are expected to have 75 mile per hour winds in Buffalo this weekend. It took me roughly 4 hours to install this product because I had to Prepare. After I installed it I started up my generator and worked flawless. Make sure you balance the loads off but for my 4500 W generator, this works perfect. Rated 5 out of 5 by ttrusty from The flex tube was a little shorter than preferred but made it work. Works great! The flex tube was a little shorter than preferred but made it work. Works great! what gauge of wire is used from the transfer switch to the outlet ?